It's official. 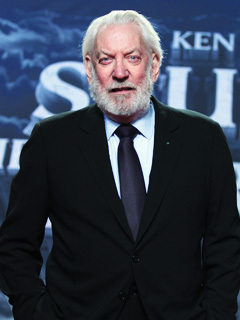 Donald Sutherland has been cast as President Snow in The Hunger Games Movie. Mr. GreenBeanSexyMan and I were eagerly awaiting this casting, and we both think this is pretty much perfect (well, Mr. GreenBeanSexyMan says perfect as an actor, but he pictured Snow to look a bit different). I'm very excited about the whole cast and I can't wait for the movie! I love this choice! He's an incredible actor. He can play sweet old man, but he can also play creepy and menacing REALLY well. He's perfect! He actually sort of fits the picture of Snow I had in my head! Lenny Kravitz as Cinna was the big shocker for me, but I'm starting to think he could really bring some interesting aspects to the character. Can't wait to see it all come together! I'm pretty excited! Sutherland is fantastic in all his movie roles. I pictured Snow a little younger and "oilier," but Sutherland can totally pull it off. Looking forward to seeing him creep on the big screen! Steph Su-I pictured him a bit younger too. Same with Cinna. But I'm still happy with the cast and I think both will do great! Excellent choice! Donald Sutherland is a little bit older than I pictured, but I think he's a master of the evil character! Wow! That's a great choice! I pictured Howie Mandel as Snow although Howie would hate that role with the blood breath.